For years, symphonic metal was the genre that dared not speak its name. With its fantasy themed lyrics and OTT orchestration, it was the soundtrack to the world’s most epic game of Dungeons & Dragons as scored by Sir Andrew Lloyd Webber. But in recent years it has undergone a radical rehabilitation in the eyes of the mainstream, to the point where symphonic metal kingpins Nightwish can even rope in heavyweight scientist Richard Dawkins to narrate one of their albums. Here, then, are the very finest offerings the genre has to offer. Though some may claim they have more in common with power metal, Blind Guardian also deserve a place on any roll call of symphonic metal’s finest, thanks largely to the way they compose and arrange their songs. Wallowing in its weighty subject matter of Tolkien’s The Silmarillion, …Middle-Earth provides a banquet of medieval/folk, speed/power metal and Queen-esque vocal twists, complete with interludes to illustrate the plot. Few albums have attained a finer, cleaner blend of orchestral sounds and heavy metal than Symphony Of Enchanted Lands. Though somewhat inferior, its eventual sequel was anointed by an appearance from fanboy Christopher Lee. However, the original is equal parts Conan The Barbarian and Last Night Of The Proms. Italy’s Rhapsody (later legally forced to a rebrand as Rhapsody Of Fire) have never sounded better. The name of Haggard may be unfamiliar to casual fans of symphonic metal but the Germans have existed since the 1990s, albeit in more death metal-style earlier incarnations. While rivals tend to utilise keys for orchestral effect, Haggard prefer to keep it real, their line-up pretty much a revolving door of players, most of whom wield traditional medieval instruments as though they were weapons. New Jersey’s Symphony X have been blending symphonic, neo-classical and power metal with progressive elements for more than two decades to create some of the most striking and colourful music around. A conceptual piece dealing with the story of Atlantis, ancient Egyptian mythology and astrological possibilities, their fifth album doffed its feathered cap at Verdi, Mozart and Bach among others. Therion remain the original and – the purists would have you believe – the best of all the symphonic metal acts. Named in honour of Celtic Frost’s second album To Mega Therion, the Swedes have been led by multi-instrumentalist Christofer Johnsson since 1987. While others have prospered by ‘sexing-up’ the genre’s principles, the Therion experience remains a pure one – sackcloth and ashes, almost. Take our word, it’s a beautiful thing. The second album from this pioneering and much-missed Dutch outfit, who ran from 1995 to 2009, Decipher employed live classical instruments and a full choir to complement the stirring soprano delivery of Floor Jansen (now, of course, with Nightwish). Soon afterwards Mark Jansen quit, taking his growled co-vocals along to the guitarist’s next band of note, Epica. 15 years afterwards, the album’s grandiose arrangements still sound masterful. 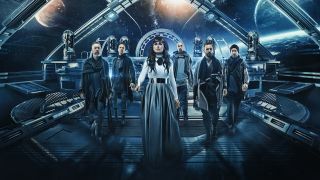 Three albums in, Holland’s Within Temptation began to discard the doomier baggage of their early days, settling upon a uplifting symphonic-based style that was rendered all the more saleable by the irresistible voice and presence of Sharon den Adel. Later on they would infuse more gothic elements and in a career nadir indulge in a regrettable dalliance with rapper Xzibit. Within Temptation have had bigger sellers than The Silent Force, though it’s doubtful they’ll write a better song than Stand My Ground. Featuring cameos from Epica’s Simone Simons and Stratovarius/Blackmore’s Rainbow keysman Jens Johansson among others, The Black Halo was the seventh album from these Americans. The conclusion of two conceptual pieces inspired by Goethe’s Faust, it picked up where predecessor Epica had left off some two years earlier. Tracks such as March Of Mephisto, When The Lights Are Down and The Haunting (Somewhere In Time) are among their very best. Debate over the merits of the three female lead vocalists employed by Nightwish will most likely rage forever, though their current frontwoman Floor Jansen is probably the best. Dark Passion Play may feature the Finnish group’s least popular singer, Anette Olzon, but it’s their finest set of songs, the Swedes’ melodic approach being perfectly suited to its material. Indeed, from the rampaging Bye Bye Beautiful, which roasted ex-member Tarja Turunen, to the almost 14-minute The Poet And The Pendulum, it’s just about perfect. This fine Dutch band has played a crucial part in the development of symphonic metal via a string of consistently impressive releases, but with The Quantum Enigma – their sixth studio record – Epica raised the bar to a whole different level, hiring a live chamber choir and a string orchestra to enhance a collection of tunes that is uniformly strong. Throw in a flame-haired mezzo-soprano by the name of Simone Simons and the results can only be described as seismic.